I usually write these blog posts in the first person plural, the "editorial we." 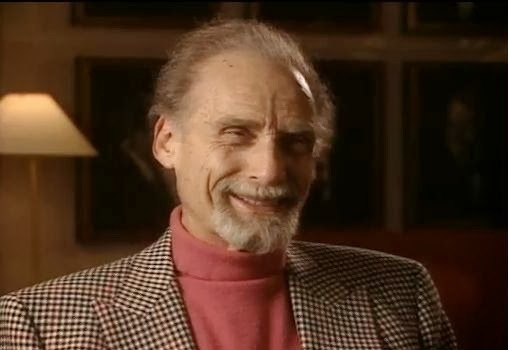 But today's remembrance of Sid Caesar, who died on Wednesday, has a personal connection that requires "I" instead of "we." I never had the privilege of meeting Sid Caesar, who was my inspiration for a growing interest in intelligent comedy. I watched every episode of Your Show of Shows, and saw Caesar act in the madcap adventure It's a Mad, Mad, Mad, Mad World many times. As Sid approached his 90th birthday, I dug into the YouTube archives to share a few video clips of his funniest performances with you, my readers. These included the Big Business sketch from Your Show of Shows, clips from a DVD of a reunion with his writers from the show, a visit of Caesar and Imogene Coca to a vegetarian restaurant, an appearance on a Chabad telethon where he performed his doubletalk language skit, and a skit in which Caesar and Nanette Fabray pantomime an argument between a married couple to the cadences of Beethoven's 5th Symphony. When I included this latter skit in a Jewish Humor Central blog post last July 18, I expected it to reach my thousands of readers, but not Sid Caesar himself. Enter my daughter, Esther Kustanowitz, an acclaimed author, blogger, and social media consultant in Los Angeles. A friend of Esther's, Rena Strober, a singer and actress, and also an L.A. resident, had befriended Sid through a Friars' Club connection and was invited to a Passover seder at Sid's house last April. Also attending were Carl Reiner and Mel Brooks. The seder led to a friendship that saw Rena visit Sid many times, listening to his stories and show business advice. A few months later, Esther told Rena about Jewish Humor Central and the Caesar-Fabray pantomime clip, which she showed to Caesar, sparking a discussion about it and whether it was improvised or rehearsed. They talked about the clip, whether it was improvised or rehearsed (the former, she remembers him saying), and how brilliant it was, and Rena told him that the clip had appeared on a friend’s father’s Jewish humor blog. This was a story born decades ago in one comedy sketch that has resonated through the years and across technology, crossing from virtual into reality. I connected to Rena through blogging. I connected Rena to my dad’s blog. And she was able to bring my dad’s virtual connection to and deep appreciation for a legendary comedian to that comedian himself. The virtual, with the intercession of real people having real conversations, enabled an ill man to understand that what he had produced in this world had resonance beyond the point that he could have imagined. I believe that this connection, midwifed by the Internet, was a gift for all of us. In the video clip below, Caesar explains and demonstrates his proficiency in speaking doubletalk in four languages in an interview with Dean Ward. May Sid’s memory — and the memories that people have of Sid, at seders or otherwise — be for a blessing, an inspiration, and more than occasionally, a guffaw. Sid Caesar and the Show of Shows Cast formed so much of my life experiences. Just about everything and anything could be laughed at made fun of. In that wonderful Black and White World, there was loving space for many kinds of characters and personalities. And, while I laughed at Abbott & Costello, Benny, Hope, Laurel and Hardy, it was Sid Caesar who, every week, had me literally rolling on the floor in helpless laughter. A priceless gift, I've never stopped appreciating. Could you post some of his very brilliant skits? I included links to some of his best in today's post. I'll post some others in the coming weeks. In ANY LANGUAGE, he was an original and THE comedy TEMPLETE for the many talented comics the followed him. My grandparents adored him---may he rest-in-peace and may his family have Hashem's strength to mourn their tremendous loss! Thank,Al..........M.A.